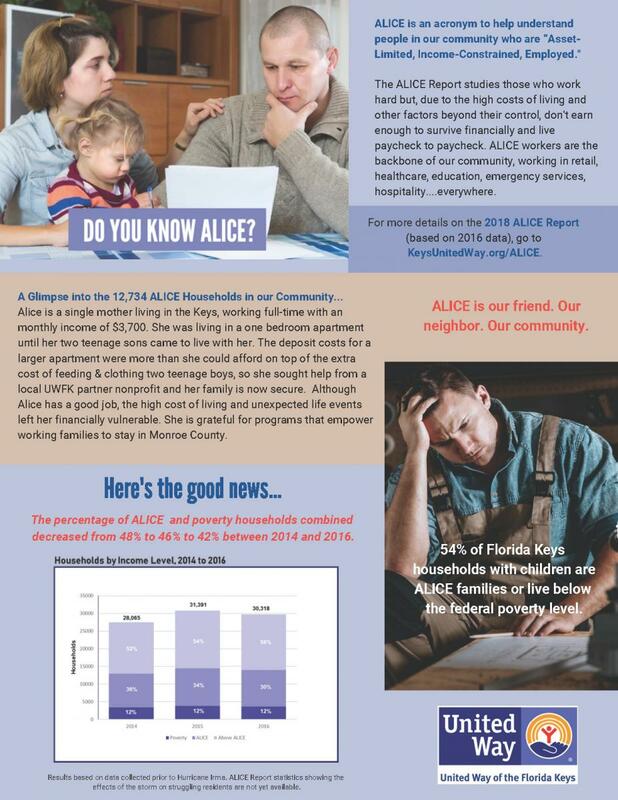 The United Way of the Florida Keys announced that 42% of year-round households in Monroe County struggle to pay for basic needs such as housing, child care, food, transportation, health care, and technology according to the 2018 ALICE Report. Statewide, 46% of households face similar financial challenges. In Monroe County, the percentage of low-income workers struggling to cover essentials has decreased for the third consecutive study from 48% to 46% to 42%. These struggling residents are Asset Limited, Income Constrained, Employed or ALICE. They are households not earning enough to cover the most basic of needs like food and housing. The 2018 ALICE Report analyzes 2016 data to determine the threshold survival budget of what it truly costs to make ends meet in a local community. This comprehensive study shows a more realistic portrayal of the number of struggling households than simply using the federal poverty limit. Monroe County again had the most expensive survival threshold budget in Florida at $27,192 for a single adult and $68,916 for a family of four with two young children. These figures represent the bare minimum that is estimated to be needed to survive financially and do not include any assets or savings. The stability budget, meanwhile, was $42,228 for a single adult and $119,628 for the two adult, two young children household. This budget reflects a more secure situation including savings needed to gain financial stability and more generous budget lines for better nutrition, healthcare, et cetera, to achieve an overall better quality of life. The biggest driver of the budget in Monroe County is the high cost of housing. Even based on the survival budget’s use of 40% of fair market value for a single efficiency unit, housing accounted for 44% of a single person’s monthly budget at $999. 54% of Florida Keys families with children are considered ALICE or are living below the federal poverty line. State-wide, wages have not increased to compensate for the rising costs of living. In Florida, 67% of jobs pay less than $20 hourly yet $27 per hour is needed to cover the basics costs of living according to the state-wide Florida survival budget. Stock Island has the highest percentage of combined ALICE and poverty level families at 63%, followed by Tavernier (54%) and Marathon (53%). The lowest percentage was North Key Largo at 22%. Bahama Village Music Program, one of UWFK's nonprofit partner agencies, shared the following story about an ALICE family they serve. 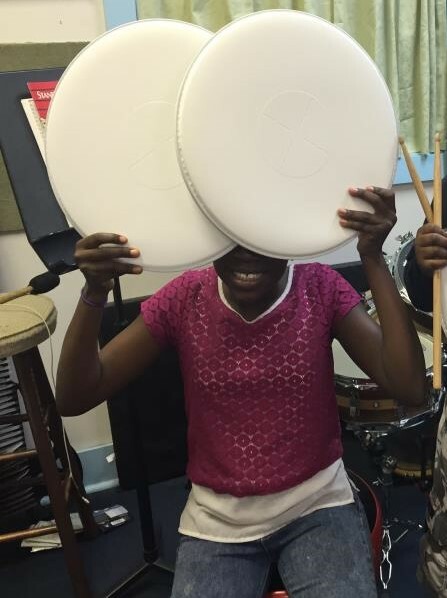 “One of Bahama Village Music Program’s star students is from one of our most economically strained families. ‘Jade’ is one of two children being raised by a hardworking, single mother who is employed as a home health aide. Every day after school, ‘Jade’ attends BVMP programs. She is a multi-instrumentalist, playing the piano and saxophone, and is always the first to help others with their instruments,” says Katchen Duncan, BVMP Executive Director. Florida is one of 18 states that have ALICE reports published. For the FULL REPORT, state or county-level ALICE data or to find county-by-county survival and stability budgets for six family sizes, visit UnitedWayALICE.org/Florida.